A photograph of Captain Richard Dean Rogers, possibly taken in Italy. 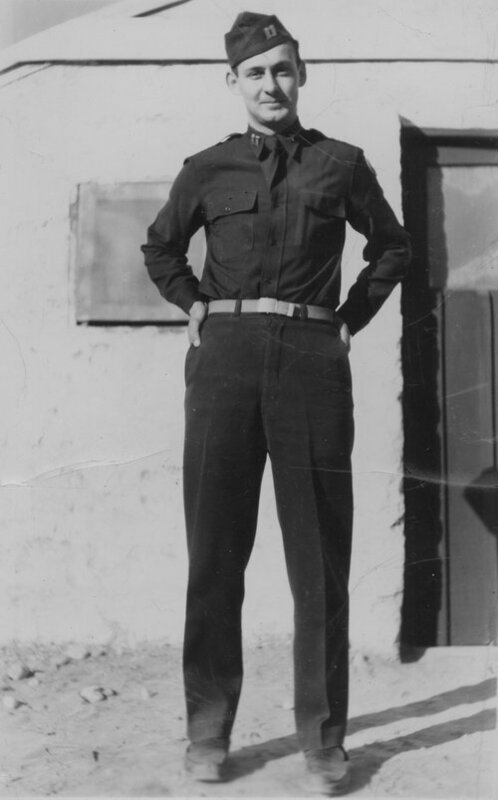 After graduating from Kansas State University and the ROTC program, on January 23, 1943, Rogers attended Officers Candidate School at Fort Benning, Georgia, where he was commissioned a Second Lieutenant in the United States Infantry. Following commissioning, Second Lieutenant Richard D. Rogers was sent to Camp Wolters, Texas, where he attended combat training school and graduated with honors. Rogers applied for pilot training in the Army Air Corps, but was sent to the bombardier-navigator school in San Angelo, Texas. He was promoted to First Lieutenant on January 7, 1945, after many flights over Europe. In April, 1945, after flying in thirty-two combat missions, he was promoted to captain. After serving three years, three months, and twenty-one days on active duty and receiving numerous medals and awards, Rogers left the Army Air Corps, but remained a member of the Reserves.